tags: A story about big dreams and small miracles. During the Vietnam War, a village that American forces are using to spy on the Ho Chi Minh Trail has its sacred elephant killed by the North Vietnamese Army because they were cooperating with the Americans. The villagers need an elephant for a ceremony that will occur within the week. Captain Sam Cahill, an easygoing man who is heading home, and his hotheaded replacement Captain TC Doyle scrounge up another elephant with the help of sneaky supply chief warrant officer David Poole, luckless farmboy Lawrence Farley, and short-timer Harvey Ashford, and transport it across South Vietnam to get it to the village on time, running into all sorts of transport problems, personality conflicts, and an NVA squad that wants the Americans out of the village. To keep the loyalty of a village during the Vietnam war, a U.S. Army officer and his unit struggle to deliver it a live elephant. Yah, hey I made a name just to argue with the idiot that made the last review for this movie. Laws of physics actually state that objects fall at the same speed no matter how heavy they are. Try it with a penny and a book at the top of your house. So don't talk about laws of physics if you are uninformed about something that is taught pretty much on Day One of Physics 101. So you may argue that it's still impossible to catch up with the elephant. Yah, it probably is, but if he went into a dive motion (a la James Bond in the beginning of Goldeneye) it's possible to decrease air resistance and increase aerodynamics in such a way to fall faster. Stunt sky-divers do it all the time. So that's the second reason why you're wrong. Talk to you later and hope you have fun posting opinionated comments about something when you have no basis or knowledge for opinion. It's 1968 Vietnam. Capt. T.C. Doyle (Ray Liotta) arrives in a Montagnard village to meet up with Capt. Sam Cahill (Danny Glover) who has been cultivating relationship with the locals. They are in NVA territory monitoring the Ho Chi Minh Trail. The kids steal Doyle's candy bar which is later discovered by the NVA commander. In retaliation, he kills the village's only elephant. Cahill promises to replace the elephant before an upcoming festival. Doyle is unconvinced. They recruit scheming supply officer David Poole (Denis Leary), short-timer Harvey Ashford (Doug E. Doug), and Lawrence Farley (Corin Nemec). They buy the elephant Bo Tat along with his handler Linh who lost his father in the war. It is such an odd tone. This is one of the few Vietnam war movies where fighting happens but nobody ever dies on screen. It tries to be funny but the odd sensibility strips it of its humor. All the elephant vomit and suppositories are not funny when there is an expectation of death and the movie avoids death like the plague. The whole tone is weirdly family-friendly but it could never be a kiddie movie. 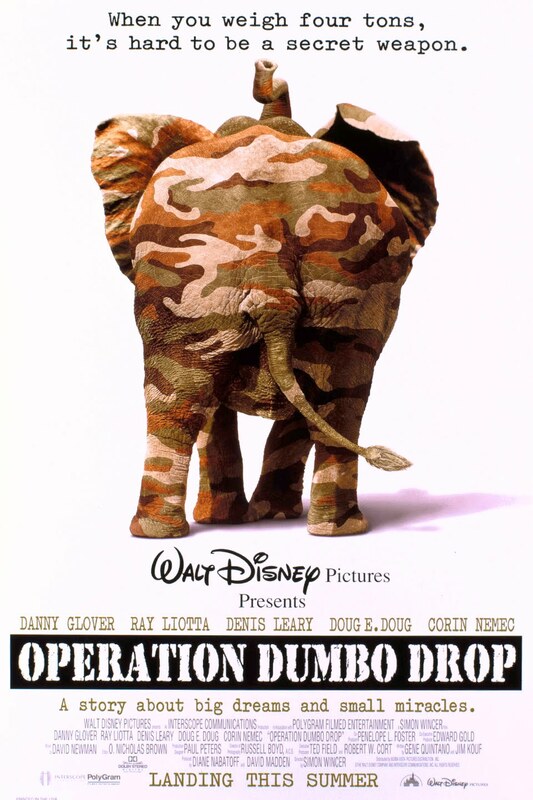 I wonder if Disney expects little kids to go see this movie for Dumbo. The whole thing is a bit off-putting.